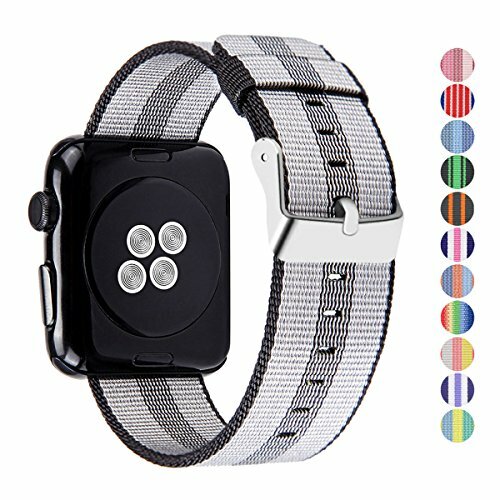 Pantheon Woven Nylon Replacement Band for the Apple Watch by, Women’s or Men’s, Strap fits the 42mm for Apple iWatch 1, 2, 3 and Nike edition by Pantheon at Kode Fu Guru. MPN: AWBN-STRP42-BLKDBLGRY. Hurry! Limited time offer. Offer valid only while supplies last. NOTICE: This product is not manufactured or endorsed by APPLE (Alphabet, Inc). We are a third party company and manufacturer of high quality Apple certified products (like battery cases). These bands are not apple certified (MFI).